Up for some smashing photos of D-Arts Bass (and his faithful canine Treble)? Look no further than Rockman Unity. Ucchy-san has just unloaded a batch of new images of the new figure. Head on over there now and have a look! Bass will be releasing in Japan on June, at a suggested retail price of 3990 Yen (about $45 US) exclusively through Premium Bandai and e-Capcom. Still no word on the North American release, but we should be hearing something any day now. 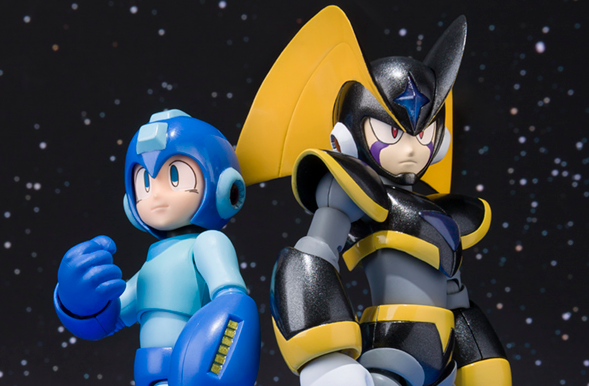 UPDATE: Bluefin Tamashii Nations has confirmed the figure for North America (that was fast!). It's due in June/July for $43.99. Looks so much better than the initial mold. So badass! Man Bandai knows how to make figures! Finally an hq Forte figure! Just preordered mine from BBTS! That D-arts Bass is badass!